Custom "Sun" Aluminum Sundial Made For Your Location With Personalized Text. Great unique gift. 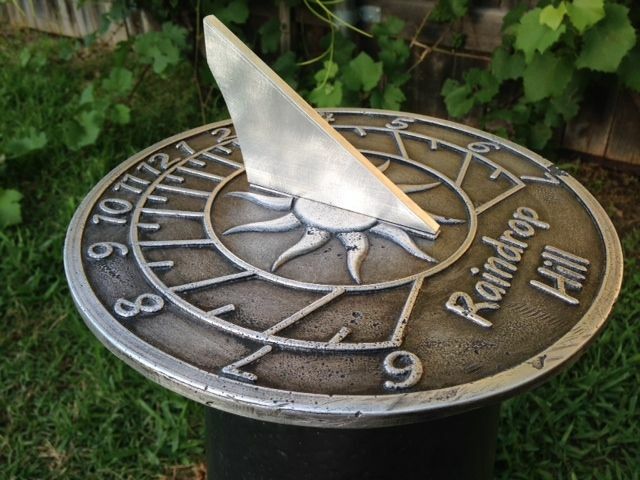 Solid cast aluminum sundial made for your location with personalized text. Sundials are not all the same. They are astronomical instruments that have lines with angles that have to be formulated for a specific location. This makes the sundial most accurate for your location. Size is 10" diameter x 1/4" thick. Please specify the text that can be 2 lines up to 12 characters each along with location (lat. long. or City or Address). Our sundials are made from recycled aluminum and weigh more than 2 pounds. All our dials are unique. Made to order. Ready to last a lifetime of casting shadows. Each dial comes with a card describing it's unique calculations and how to use. Sundials bring life to any garden.